Physicists love symmetry! Using symmetry can dramatically simplify a problem. The concept of symmetry is at the heart of modern theoretical physics and some of the most beautiful of scientific results. In this post, I’ll give a brief introduction to how physicists think about symmetry. Symmetry can be employed in a number of ways when tackling a problem; we’ll have a look at how they can help you ask the right question and then check that your answer makes sense. In a future post I hope to talk about Noether’s Theorem, my all-time favourite result in theoretical physics, which is deeply entwined with the concept of symmetry. First, we shall discuss what we mean when we talk about symmetry. Possibly the most familiar symmetry would be reflection symmetry, when something is identical to its mirror image. Something has reflection symmetry if it is invariant under switching left and right. Squares have reflection symmetry along lines in the middle of their sides and along their diagonals, rectangles only have reflection symmetry along the lines in the middle of their sides, and circles have reflection symmetry through any line that goes through their centre. The Star Trek Mirror Universe actually does not have reflection symmetry with our own Universe. First, they switch good and evil, rather than left and right, and second, after this transformation, we can tell the two universes apart by checking Spock’s beard. Rotational symmetry is when an object is identical after being rotated. Squares are the same after a 90° rotation, rectangles are the same after a 180° rotation, and circles are the same after a rotation by any angle. There is a link between the rotational symmetry of these shapes and their mirror symmetry: you can combine two reflections to make a rotation. With rotations we have seen that symmetries can either be discrete, as for a square when we have to rotate by multiples of 90°, or continuous, as for the circle where we can pick any angle we like. Translational symmetry is similar to rotational symmetry, but is when an object is the same when shifted along a particular direction. This could be a spatial direction, so shifting everything to the left, or in time. This are a little more difficult to apply to the real world than the simplified models that physicists like to imagine. For translational invariance, imagine an infinite, flat plane, the same in all directions. This would be translational invariant in any direction parallel to the ground. It would be a terrible place to lose your keys. If you can imagine an infinite blob of tangerine jelly, that is entirely the same in all directions, we can translate in any direction we like. We think the Universe is pretty much like this on the largest scales (where details like galaxies are no longer important), except, it’s not quite as delicious. The backgrounds in some Scooby-Doo cartoons show periodic translational invariance: they repeat on a loop, so if you translate by the right amount they are the same. This is a discrete symmetry, just like rotating my a fixed angle. Similarly, if you have a rigid daily routine, such that you do the same thing at the same time every day, then your schedule is symmetric with respect to a time translation of 24 hours. Exchange symmetry is when you can swap two (or more) things. If you are building a LEGO model, you can switch two bricks of the same size and colour and end up with the same result, hence it is symmetric under the exchange of those bricks. The idea that we have the same physical system when we swap two particles, like two electrons, is important in quantum mechanics. In my description of translational symmetry, I could have equally well have used lime jelly instead of tangerine, or even strawberry, hence the argument is symmetric under exchange of flavours. The symmetry is destroyed should we eat the infinite jelly Universe (we might also get stomach ache). Mario and Luigi are not symmetric under exchange, as anyone who has tried to play multiplayer Super Mario Bros. will know, as Luigi is the better jumper and has the better moustache. There are lots more potential symmetries. Some used by physicists seem quite obscure, such as Lorentz symmetry, but the important thing to remember is that a symmetry of a system means we get the same thing back after a transformation. Sometimes we consider approximate symmetries, when something is almost the same under a transformation. Coke and Pepsi are approximately exchange symmetric: try switching them for yourself. They are similar, but it is possible to tell them apart. 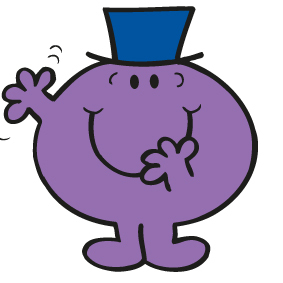 The Earth has approximate rotational symmetry, but it is not exact as it is lumpy. The spaceship at the start of Spaceballs has approximate translational invariance: it just keeps going and going, but the symmetry is not exact as it does end eventually, so the symmetry only applies to the middle. When studying for an undergraduate degree in physics, one of the first things you come to appreciate is that some coordinate systems make problems much easier than others. Coordinates are the set of numbers that describe a position in some space. The most familiar are Cartesian coordinates, when you use and to describe horizontal and vertical position respectively. Cartesian coordinates give you a nice grid with everything at right-angles. Undergrad students often like to stick with Cartesian coordinates as they are straight-forward and familiar. However, they can be a pain when describing a circle. If we want to plot a line five units from the origin of of coordinate system , we have to solve . However, if we used a polar coordinate system, it would simply be . By using coordinates that match the symmetry of our system we greatly simplify the problem! Pirates are trying to figure out where they buried their treasure. They know it’s 5 yarrrds from the doughnut. 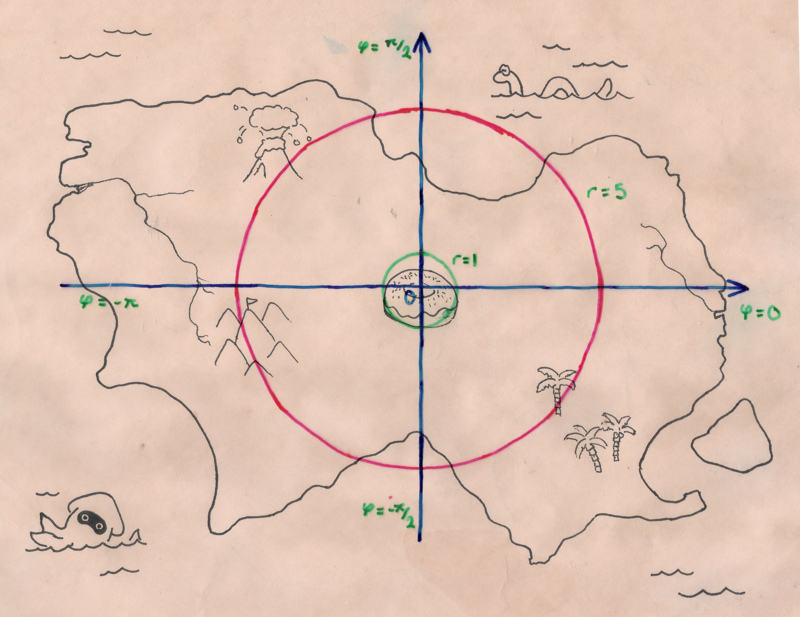 Calculating positions using Cartesian coordinates is difficult, but they are good for specifying specific locations, like of the palm tree. 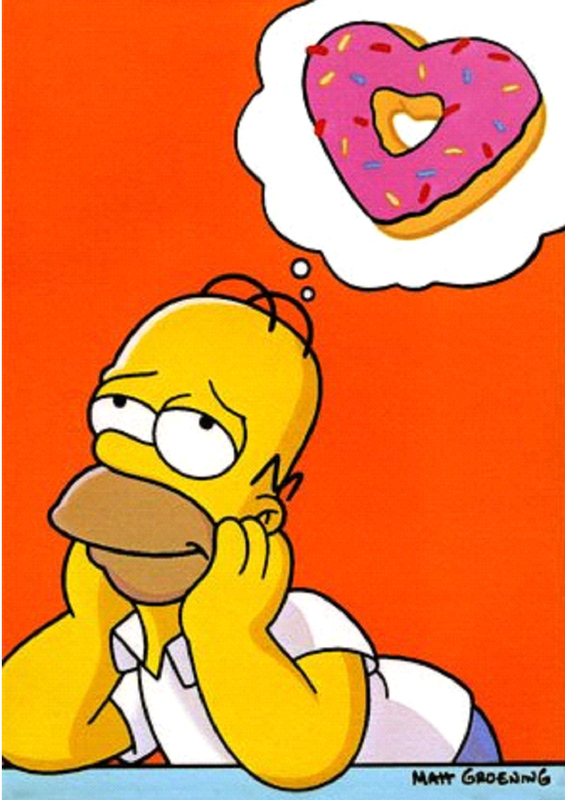 Using polar coordinates, it is easy to specify the location of points 5 yarrrds from the doughnut. 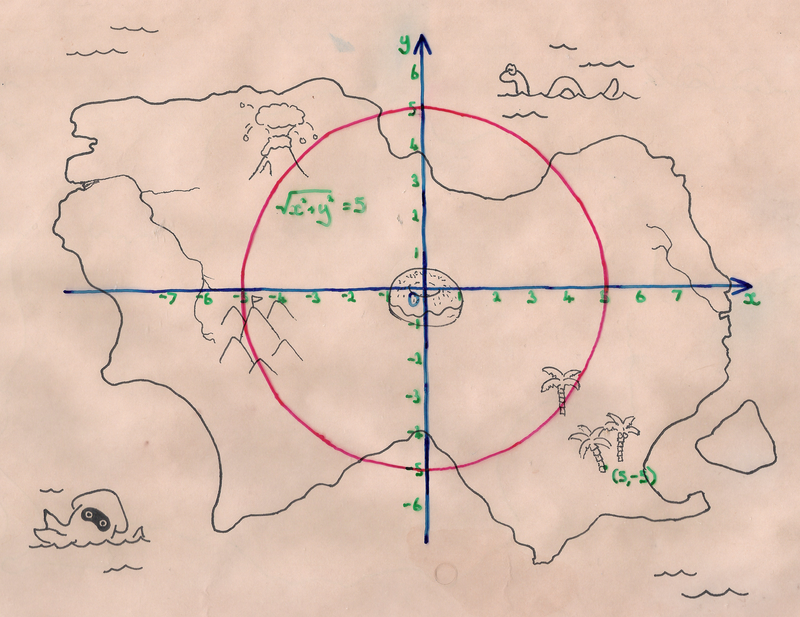 Pirates prefer using the polar coordinates, they really like using r.
Picking a coordinate system for a problem should depend on the symmetries of the system. If we had a system that was translation invariant, Cartesian coordinates are the best to use. If the system was invariant with respect to translation in the horizontal direction, then we know that our answer should not depend on . If we have a system that is rotation invariant, polar coordinates are the best, as we should get an answer that doesn’t depend on the rotation angle . By understanding symmetries, we can formulate our analysis of the problem such that we ask the best questions. At the end of my undergrad degree, my friends and I went along to an awards ceremony. I think we were hoping they’d have the miniature éclairs they normally had for special occasions. There was a chap from an evil corporation™ giving away branded clocks, that apparently ran on water. We were fairly convinced there was more to it than that, so, as now fully qualified physicists, we though we should able to figure it out. We quickly came up with two ideas: that there was some powder inside the water tank that reacted with the water to produce energy, or that the electrodes reacted in a similar way to in a potato clock. We then started to argue about how to figure this out. At this point, Peter Littlewood, then head of the Cavendish Laboratory, wandered over. We explained the problem, but not our ideas. Immediately, he said that it must be to do with the electrodes due to symmetry. Current flows to power the clock. It’ll either flow left to right through the tank, or right to left. It doesn’t matter which, but the important thing is the clock can’t have reflection symmetry. If it did, there would be no preferred direction for the current to flow. To break the symmetry, the two (similar looking) electrodes must actually be different (and hence the potato clock theory is along the right lines). My friends and I all felt appropriately impressed and humbled, but it served as a good reminder that a simple concept like symmetry can be a powerful tool. A concept I now try to impress upon my students, is to use symmetry to guide their answers. Most are happy enough to use symmetry for error checking: if the solution is meant to have rotational symmetry and their answer depends on they know they’ve made a mistake. However, symmetry can sometimes directly tell you the answer. Lets imagine that you’ve baked a perfectly doughnut, such that it has rotational symmetry. For some reason you sprinkled it with an even coating of electrons instead of hundreds and thousands. We now want to calculate the electric field surrounding the doughnut (for obvious reasons). The electric field tells us which way charges are pushed/pulled. We’d expect positive charges to be attracted towards our negatively charged doughnut. There should be a radial electric field to pull positive charges in, but since it has rotational symmetry, there shouldn’t be any field in the direction, as there’s now reason for charges to be pulled clockwise or anticlockwise round our doughnut. Therefore, we should be able to write down immediately that the electric field in the direction is zero, by symmetry. Most undergrads, though, will feel that this is cheating, and will often attempt to do all the algebra (hopefully using polar coordinates). Some will get this wrong, although there might be a few who are smart enough to note that their answer must be incorrect because of the symmetry. If symmetry tells you the answer, use it! Although it is good to practise your algebra (you get better by training), you can’t learn anything more than you already knew by symmetry. Working efficiently isn’t cheating, it’s smart. Symmetry is a useful tool for problem solving, and something that everyone should make use of.